I consider myself a safe and smart rider. I've ridden in pretty much every condition that Mother Nature has dished out on me. Well, I haven't ridden through a tornado yet, but I'm sure that when one touches down in Portland, it will find me. Anyways, there have only really been a couple of times where my thrill of riding has outweighed my rational and safety-oriented thinking. And when the cop pulled me over and said, "Son, this ain't no race track," all I could reply was, "Well, my helmet is designed for it." 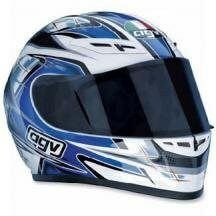 The GP-Tech Full Face Helmet made by AVG is one of those DOT helmets that screams for speed. It's made of a 2-piece dual-density carbon Kevlar construction which gives it superior strength. The venting is done by the IVS (Integrated Ventilation System), which features channels hollowed directly into the shell of the helmet. This helps keep you cool without direct exposure to the wind on your skin and actually cools the whole helmet down, instead of just your hair. The visor is an anti-fog and anti-scratch polycarbonate clear Racer-X visor with tear-off system, which takes only seconds to take off and replace with a tinted one without the use of any tools. Try to keep in mind that just because the helmet is track-worthy, it doesn't make every road (even the deserted back country roads) an instant race track to blast down. You never know when Johnny Law will be there to remind you. Click here to find this helmet on Revzilla.com.